Here’s an inspiring story of a barber who caters to major league baseball players and other superstar athletes and he does it mostly on the run! Angel Lucas Pena worked his way into one of the most prolific circles for a any business person, let alone a barber, by being aggressive and being really good at those haircuts. 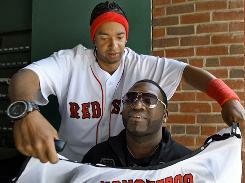 Read how a great haircut for Red Sox player David Ortiz turned into boom times for Mr. Pena! You won’t find Pena’s name in a program or media guide. He has no background in baseball and is not a trainer, team executive or agent, but he is trusted by virtually every star in the game. Pena, nicknamed “Monster99,” is the barber of baseball. Pena, a 33-year-old product of New York City, has a contact list that would make agent Scott Boras envious. In the last few months, he has cut the hair of a wide array of baseball luminaries. From players such as Ryan Braun, Miguel Cabrera, Prince Fielder, Ryan Howard, Torii Hunter, Matt Kemp, Cliff Lee, Tim Lincecum, Manny Ramirez, CC Sabathia and Justin Upton to Hall of Famers Yogi Berra and Reggie Jackson to Chicago White Sox manager Ozzie Guillen to New York Mets general manager Omar Minaya.